That iPhone touchscreen was what got me the first time I used it, and it’s not just a hunch that Apple’s touchscreen is better than other devices, it has just been proved. By a robot. We’re not saying it’s a better phone – there are lots of different criteria for that, but we’re just saying the touchscreen is more accurate. And because it knows more accurately where your finger is, that comes across as more responsive. 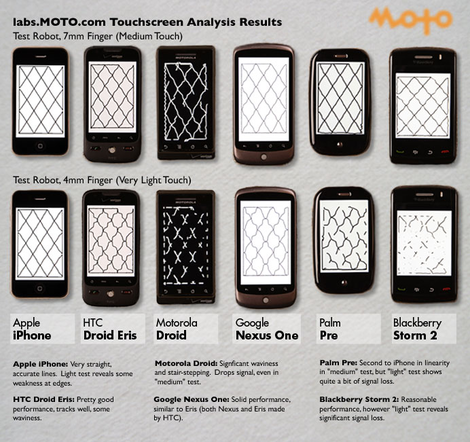 The test compared an iPhone with a number of other touchscreen smartphones: Google Nexus One, Motorola Droid, Palm Pre, HTC Droid Eris, and BlackBerry Storm 2, using the using the SimpleDraw application on each. The Motorola Droid came out worst. Test results in the image above.